We're back after a terrible journey via the tunnel with delays on the motorway there and then nearly four hours wait at the terminal for a train because of an earlier power cut. No matter, we arrived safely, the cat is alive and coping with the change of environment and France Telecom very efficiently reconnected the line within 36 hours of receiving our fault report. With the help of a friend we made the repair request via 1013.fr which is the France Telecom online fault reporting service. This saved the problem of finding a working phone box and negotiating the touch menus before making contact with a call centre operative but of course is only of use if you have access to the internet via alternative means to your usual connection. This service worked for us. Of course, having a renewed connection doesn't mean we're completely back in the swing of internet interaction - I rather enjoyed the sensation of no internet or telephone for a few days so blog fluency may take a moment or two to fully bloom again, not helped by the fact the computer is a long way away from the fire and it's cold out here. 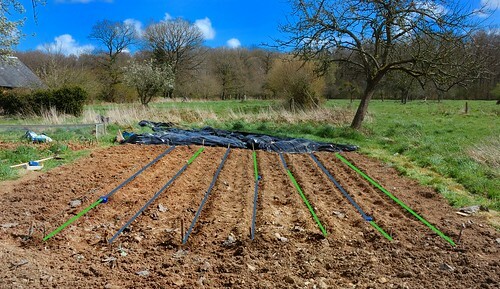 Some progress has already been made in the garden, with the benefit of some clement weather all the potatoes have been planted in the newly rotavated patch destined for them. It was tremendously hard work and Paul carried the brunt of it, manhandling the machine up and down in the stony ground until it submitted and became friable soil. A french trenching tool made the planting rows and we popped the spuds in today, 160 of them in all, nine varieties from early Swift to late Pink Fir Apple. They're not planted deeply and will be covered with plastic to keep them warm and in the dark. The plan this year is to spray and spray and spray again to try to keep the blight away using traditional Bordeaux mixture, which I don't think is approved for organic use any more but something must be done. If you click through on the picture below you can read the notes showing which row is planted with each variety of potato.